Republican presidential candidate Ted Cruz wrapped up a two-day campaign swing through Iowa with a speech tonight in Des Moines and a warning about the agreement the Obama Administration appears headed toward making with Iran. President Obama earlier today said the framework negotiators from seven countries developed after months of negotiations “would cut off every pathway that Iran could take to develop a nuclear weapon.” Cruz tonight said Iran is run by “religious zealots who embrace death and suicide” and they cannot be trusted. “I think the fundamental problem is this administration does not understand the people with whom they are dealing,” Cruz said. Cruz, a Texas Senator, got applause and cheers from the crowd when he pledged to urge his fellow senators to “stand up and reject” the deal. Jim Anderson of Des Moines was the man in the crowd who asked Cruz the question about Iran. 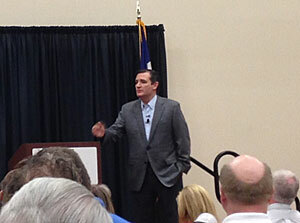 After posing for photos and shaking hands with Anderson and others in the crowd for more than 20 minutes, Cruz answered a few questions from reporters and warned the U.S. may be pushed into a military confrontation with Iran. Cruz became the first candidate to officially enter the presidential race nine days ago. He will return to Iowa next week to speak at a statewide meeting of home schooling families.